The secret to a successful blog is great content and great content will, in turn, generate traffic to your blog providing it is found. Because content is king, right? So let’s dig into my blogging tips for 2018 to help get your great content seen. The first of my blogging tips is to set your site up for success. And to generate traffic all day every day you will need to learn some SEO so that you are found by search engines. SEO may be a bit daunting at first but it really is just about optimizing the pages the way that Google likes them. Here are a few on-page ranking factors that should be on your SEO checklist when creating a new blog article. These are just a few of the basic SEO ranking factors which can be crossed off a list. Any of the SEO Plugins that you can add to WordPress basically just provide you with a checklist or if you like a SEO to do list. SEO is not hard and to prove it you just need to read my Simple Guide To SEO 2018 article which currently sits on page one of Google. And that is the power of Google once you can get some traction and get some favourable search results like my SEO Guide now has the traffic then flows in all day every day. So for me, the most important blogging tip is to get Google working for you. The second of our blogging tips for 2018 is to leverage your social channels and social media. Choose 3 or 4 good social channels to work with. Brand those channels to your site and share to those channels, consistently. Don’t just share your own content. Share related stories that you like to add value to your channels. Your socials should not just be about you. Adopt the 80/20 rule where you post 80% about your niche and mix in 20% of your own content. These are the sites that you share to but don’t spend much time on. The rules are pretty much the same as above, with branding following your site and using the 80/20 rule. Hashtags give you the opportunity to be seen by anyone who searches the tags you use. Don’t go crazy with them though, I would suggest no more than 3 unless your content is long in length then you can squeeze a few more in. What you don’t want is for your shares to look spammy and create the wrong impression. You have a chance to be quite clever here and not only offer an easy sharing solution for visitors but to also control the message that is shared with hashtags of your choice. Add a few plugins that help with this. You definitely need share buttons strategically placed on your site but take it further and seek out plugins that allow you to write a catchy call to action. Tweet This is a great Twitter Plugin that lets you make sections of text clickable links. When clicked you share the text as a tweet and any tags you assign to the text when you make it a tweet. If you are following my SEO Guide (linked above) then you already know about optimizing images and adding text and hashtags for Pinterest. Google likes to see new content published so work on a blogging schedule and post once or twice a week depending on your available time. You don’t have to go crazy it is better to create quality rather than quantity. But create quality regularly. There is only so much time in the day so when you cant create new content then update existing content and keep it evergreen. This becomes more and more important as you continue to blog. Keeping posts up to date refreshes them and keeps them relevant to your audience and your new audience as you are found more. It doesn’t have to cost you money to automate your social media. There are lots of really clever things you can do with IFTTT. For example, you can set up that when you Tweet you also post on Facebook or Instagram or wherever. Just bear in mind how what you share looks where you share it. All sites have different optimal image sizes so what looks good on one site may look terrible on another. 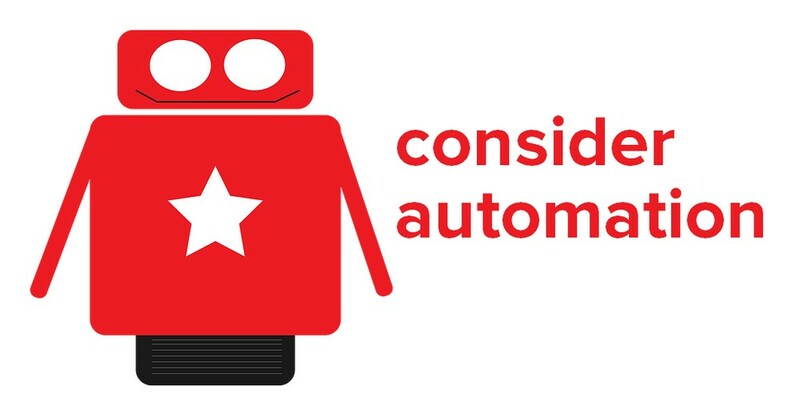 You also don’t want to appear automated or you will kill your engagement. Here is my ViralContentBee Guide. Blog commenting is really just another way to get traffic and engagement on your site. But for this to work you have to give a little to receive. Commenting on other bloggers articles give you a click-through link to your own site so if anyone likes what you say they can easily find you and comment on one of your articles. Relationships can be built this way. You may want to offer so other bloggers the opportunity to guest blog on your site. Or you may want to find others who will let you post on theirs. If you guest blog for others then remember what you create has to be as good if not better as what you add to your own site. Again guest blogging is a great method to put you out there in front of new readers. It’s also a great source of backlinks and additional traffic. When you write an article qualify what you say. Link to sources that confirm and qualify what you are writing about. This will ping site owners and you may well get reciprocal backlinks or at least some traffic as the webmasters visit to see why you linked to them. If they like what you have written you may get comments. You will more than likely get some shares because it is in their best interests for you content to be seen as they are part of it. Your images are going to get pinned. They are going to appear on Google Images so let people know who created the images right away. Add your site logo or name or both to images that you create. Read lots, educate yourself. Stay ahead of the game. You will always have ideas for new content if you do. There are a lot more tips that I could have implemented into this article. Like Free Giveaways, and perhaps mentioned about running competitions etc. And they would have been great tips to include. 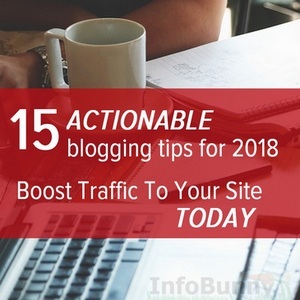 But the 15 Blogging Tips for 2018 that we have mentioned are the ones that I consider to be the most valuable and beneficial for generating traffic quickly and consistently. Do you have any blogging tips that you would like to share? Would you like to guest post on Infobunny? 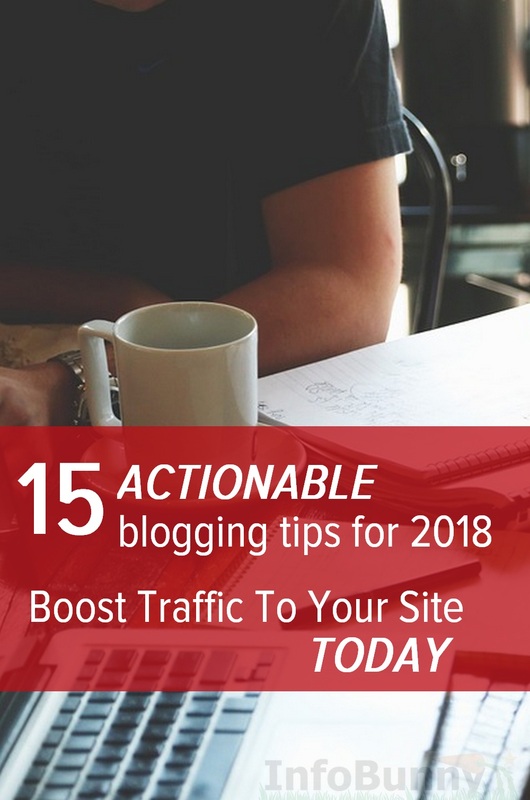 If you are thinking of starting a blog then here are 15 actionable blogging tips for 2018 that will generate traffic to your blog almost instantly The secret to a successful blog is great content and great content will, in turn, generate traffic to your blog providing it is found. Because content is king, right? Awesome post and tips! I will have in mind all those tips for my next blog post. Great, link me in when you post. like always you have a lot of suggestion which we can consider to try, something for everyone. I saw you write about hashtags, this is something I always forget and also the automation part is something I do not feel good about. I will try some of your ideas. We are not talking about bots or anything sinister, just auto shares on your less valuable social channels. Nice article. I think first step is to choose a very impressive and trending topic to start a blog. Then comes keyword selection and there obviously quality content and SEO. What do you say about first thing first? Trending if possible, but if it is trending have you not missed the boat. Lately I am writing posts about questions that are asked in a Facebook group. It is a source of inspiration and provides some relevant information. Thank you for a nice summary. There are social sites that are just built on answer questions. make sure to bookmark your site and will eventually return sometime soon. this was really a very great post. Look at all those stumbles! Congratulations! Great tips with a great graphic. I keep forgetting about Viral Content Bee. Lately, I’m promoting in places that will point links from high DA sites to my blog. I’m off to share. Lots of great information here on blogging. Happy to share it. I will need to look into that. you have immense knowledge about the topic. This tips are very useful for generating more traffic through blogging. I am getting great insights and tips here. Its really useful and thanks for the post. One thing I know I’m not good at, is SEO. But good thing I stumbled upon this blog today! 🙂 I believe, I’ve stumbled upon a very useful blog, full of tips for the striving new bloggers around the world. Thanks for sharing your expertise Dexter! this is an awesome page! If you are interested in SEO then checkout my Mobile SEO Guide linked in the commentLuv comment and my general SEO Guide linked in the menu bar. aLL All the info provided is free so if you want to help get it out there just share and if you link back to my guides then even better. nice tips for traffic but social media need strong relations with followers and friends and you need relevent following then you get traffic otherwise no. Guest blogging is a fun way to drive traffic Dexter. Digging these tips bro. I went on a guest post blitz last year. This year is about genuine blog commenting on a high volume of blogs. Quick and easy way to befriend bloggers; plus you glean fabulous information from the blog post itself. Win-win on so many levels. Nice article. This will instantly help those who plan on starting there blog site. Thank you for these useful contents. Thanks for the kind words. Hope these blogging tips are useful who those who fid them.